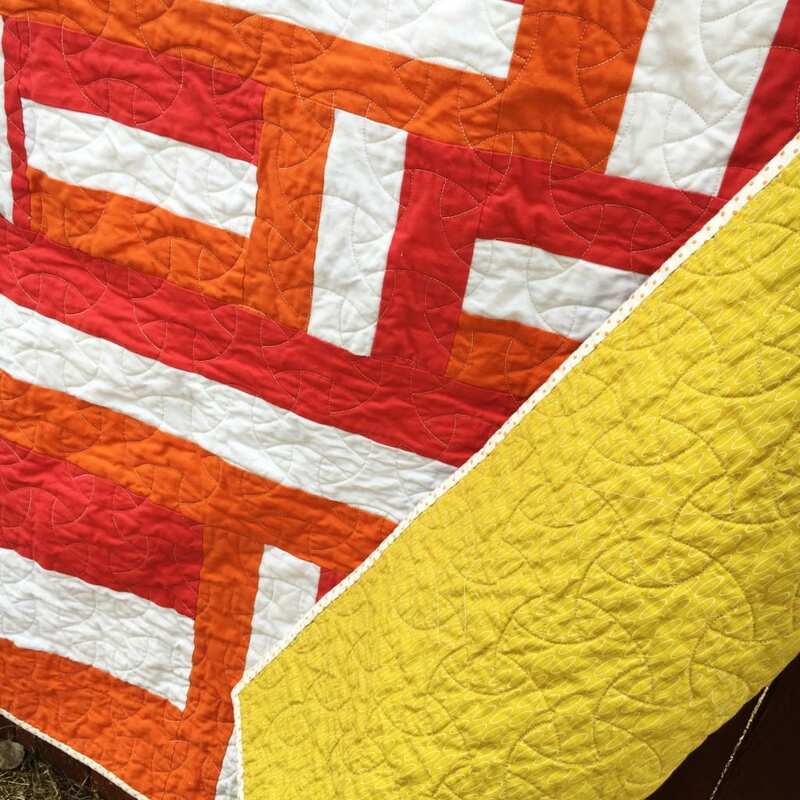 Free Quilt Pattern – Off the Rails! Hi friends! Meet Off the Rails. 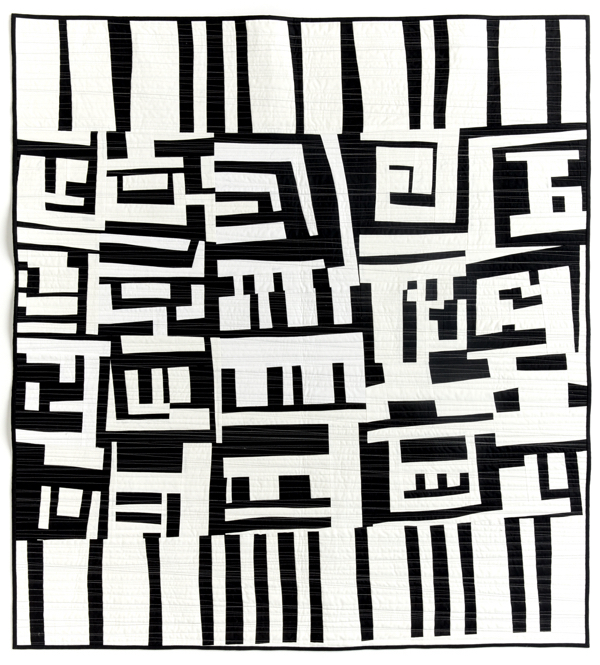 This quilt is my exploration of modern traditionalism in quilts. 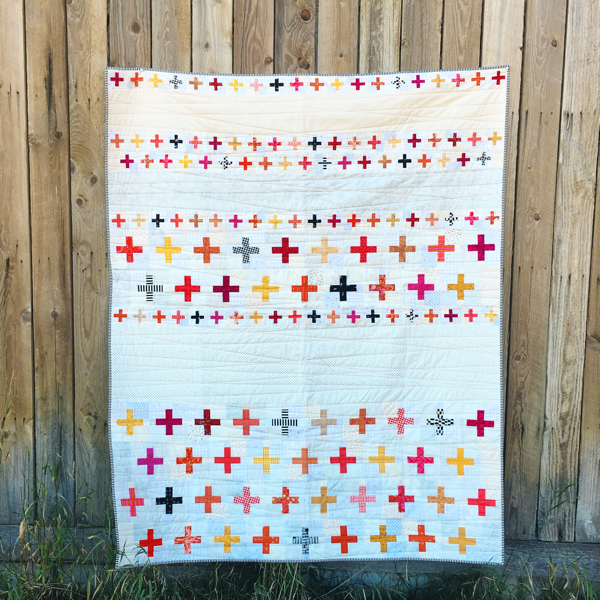 The ladies over at Simple Simon & Company – have invited everyone to explore the definition of a modern quilt throughout the year with a different theme each month. You can read more about it HERE. 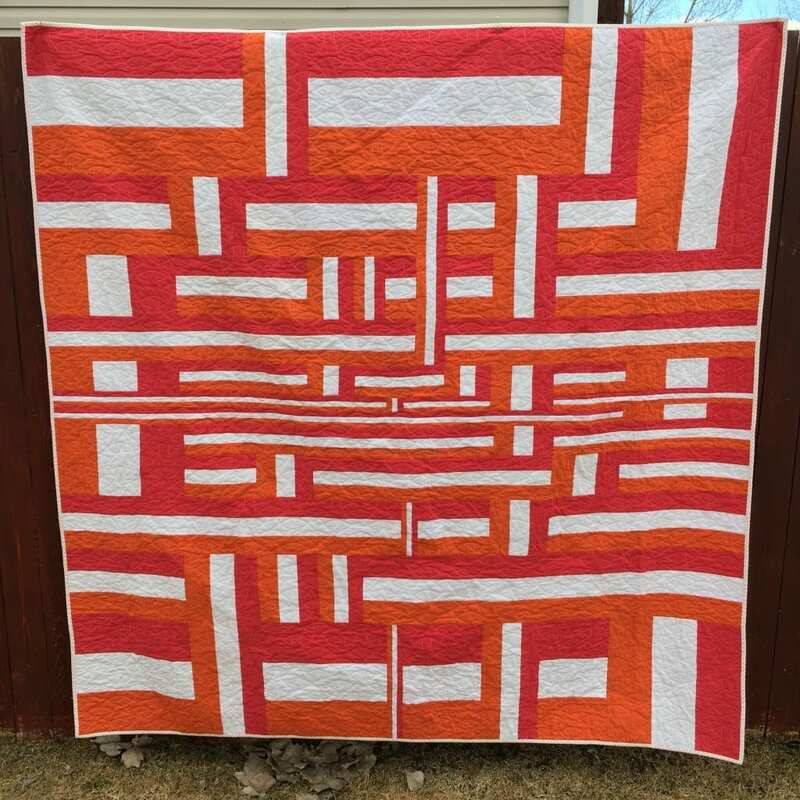 The flat shot better displays the quilt! 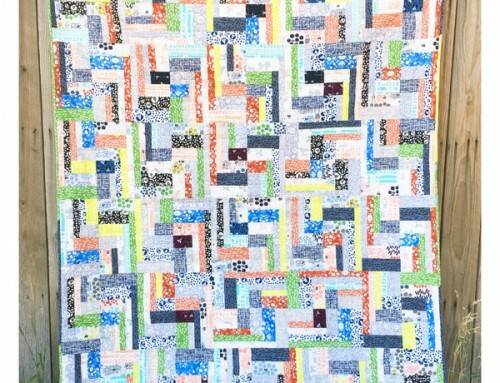 I took a traditional rail fence block, and changed the size of the block, and length of units cut throughout the quilt. It was a fun puzzle to put together! After some planning and a lot of math, I sewed my strip sets and got busy cutting the various segments. To save myself a couple headaches, I wrote with a washable marker on each segment, so that I knew exactly which piece was which. 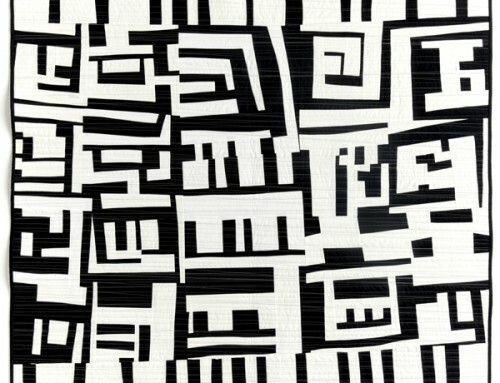 I thought about sticky notes, but those never stick to fabric very well. It went together pretty quickly, all straight seams and a few partial seams to include a few of the vertical pieces. I backed it with a bright yellow fabric, and found the perfect print for the binding. 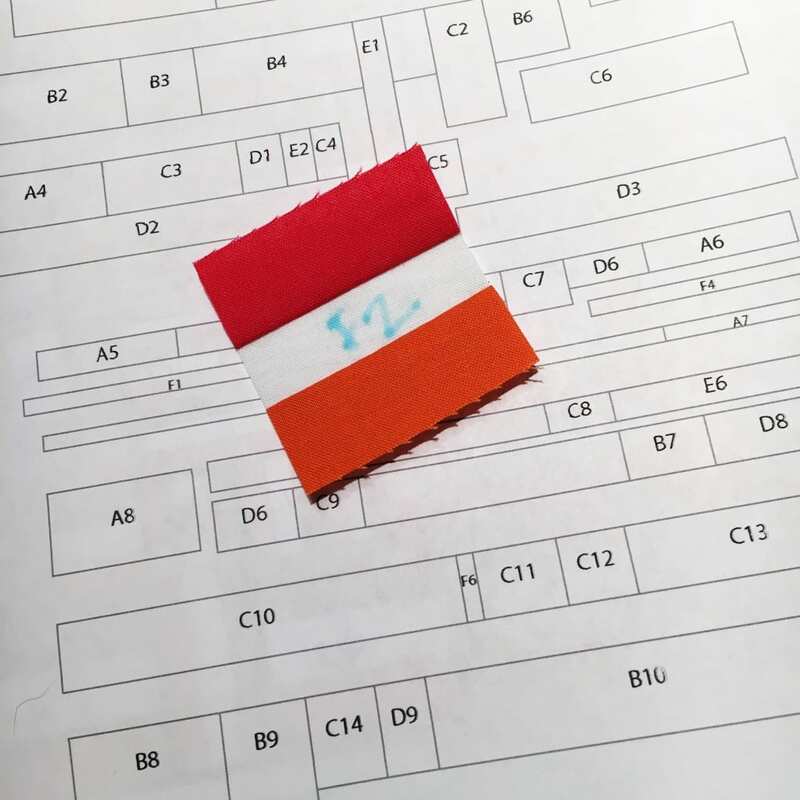 It’s a dot that incorporates both the orange and pink colors. 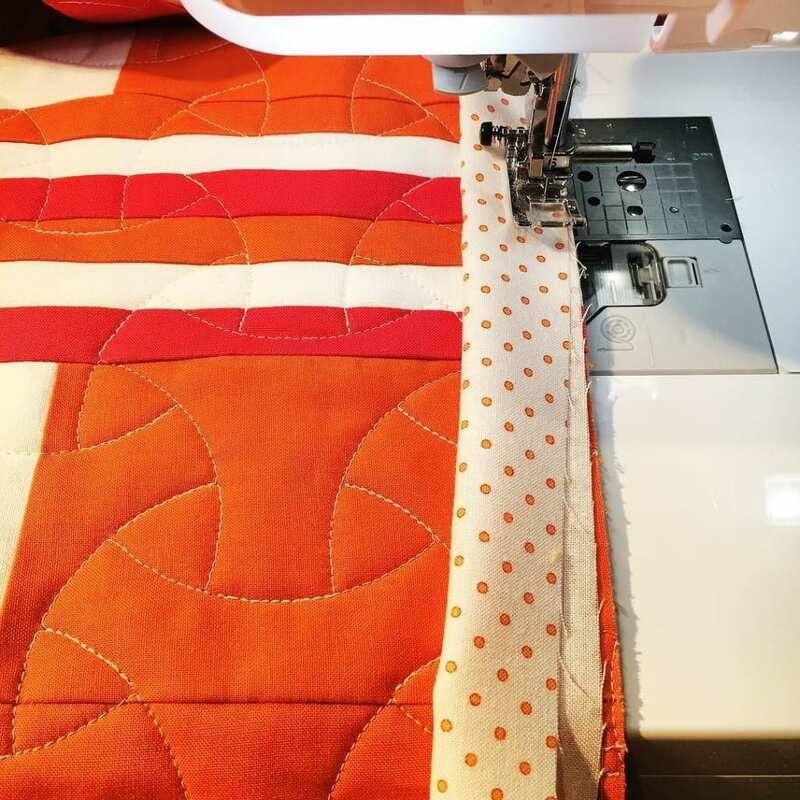 The quilting is a bit of a puzzle too, it was fun to watch it stitch out! 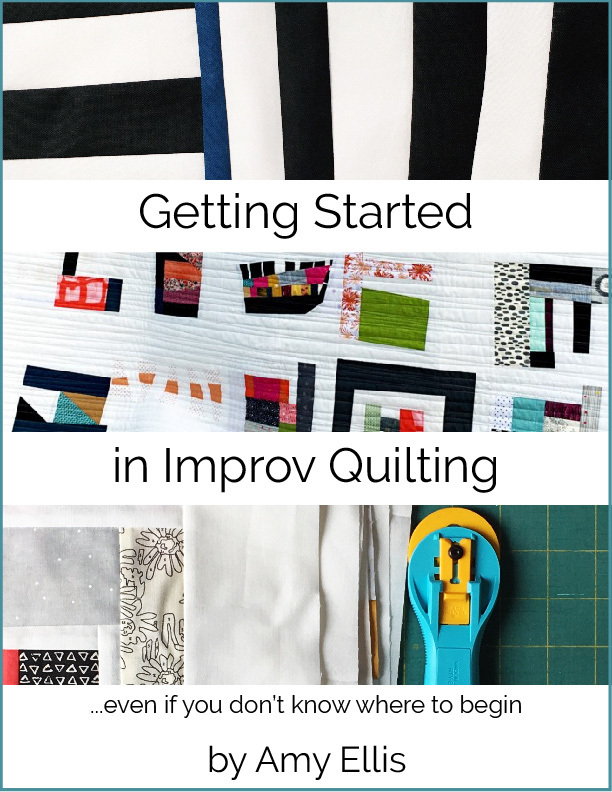 For all my tips on making and attaching a binding, click HERE. 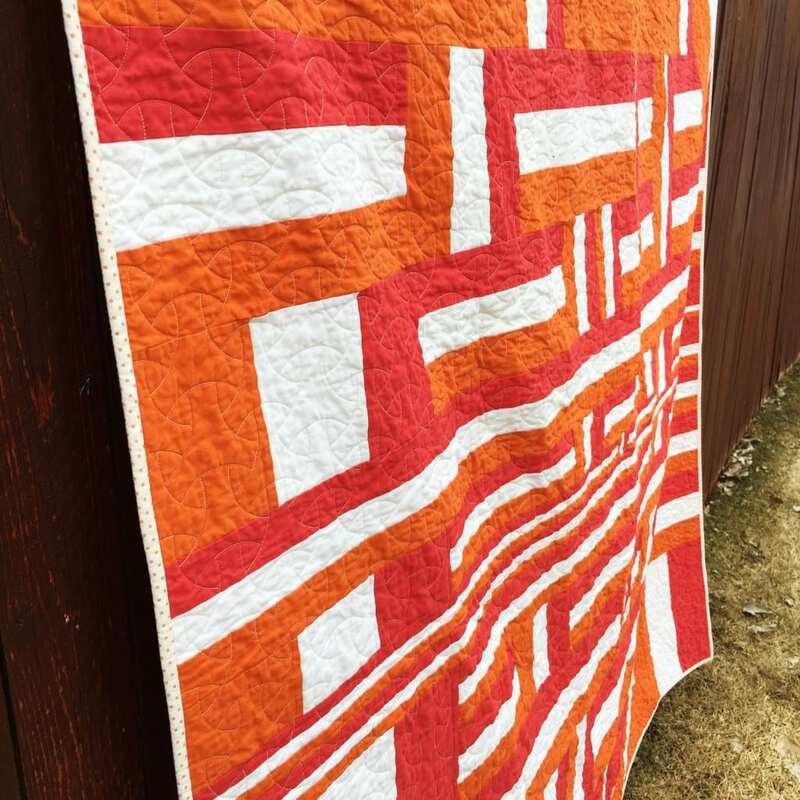 It’s such a fun to make and very dynamic, I thought it was time for a free pattern! To get your copy, click the button below, and fill out the quick form. 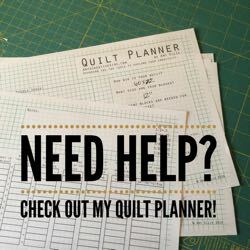 You will get a link to download the pattern in your email, shortly. 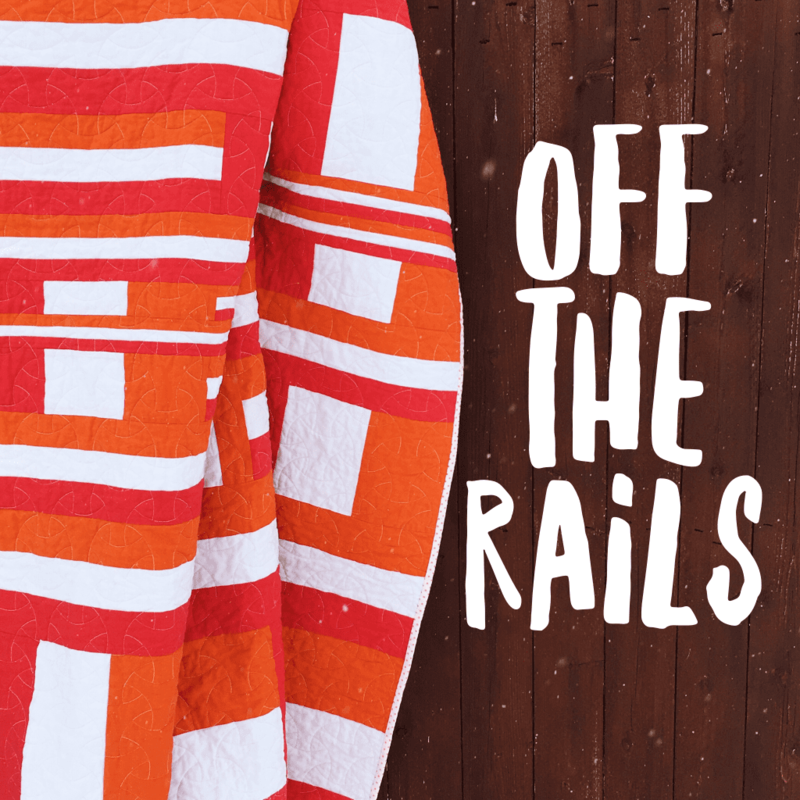 Off the Rails – Free Quilt Pattern! Let me know what you think! 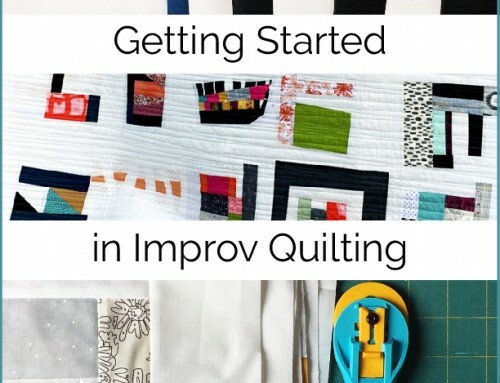 I can’t wait to see it in different fabrics, I hope you are inspired to try something new! 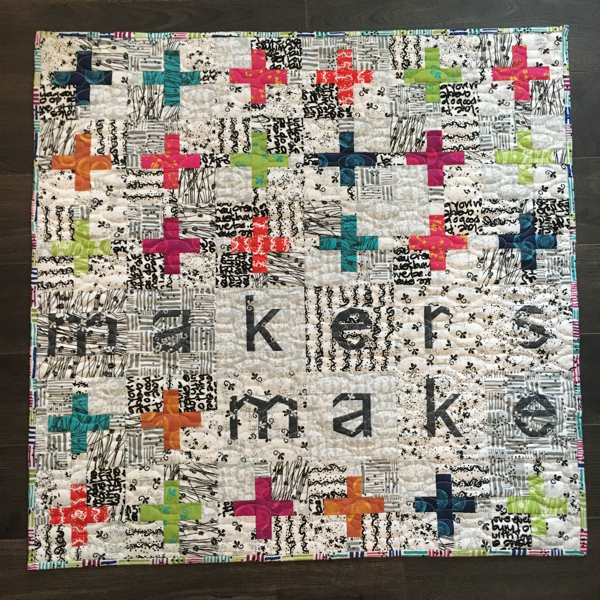 Thank you, Amy, I love this quilt! So cool! 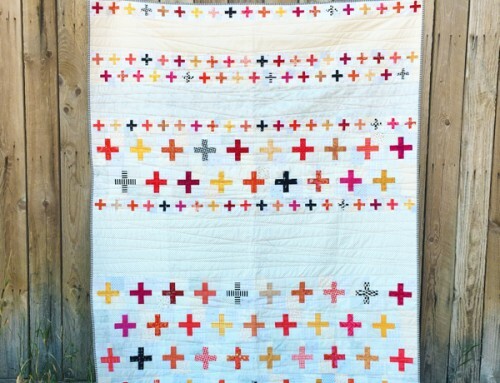 I really will enjoy doing this quilt. I inherited two old tops that were rail fences from the 40-50’s. Couldn’t have come at a better time – Off The Rails pretty much describes my life right now. 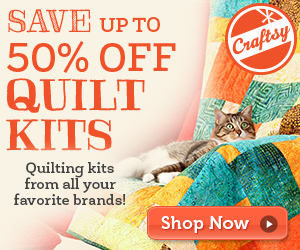 Love the quilt – thanks so much for the freebie. 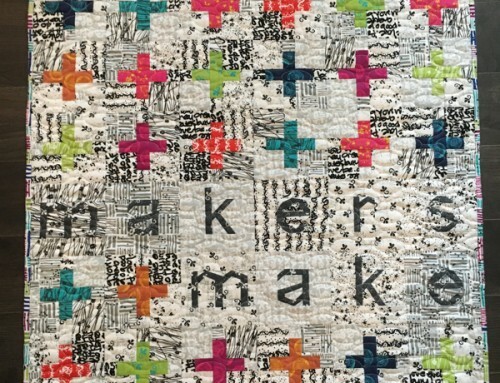 Thank you, Amy, for the fun quilt pattern! 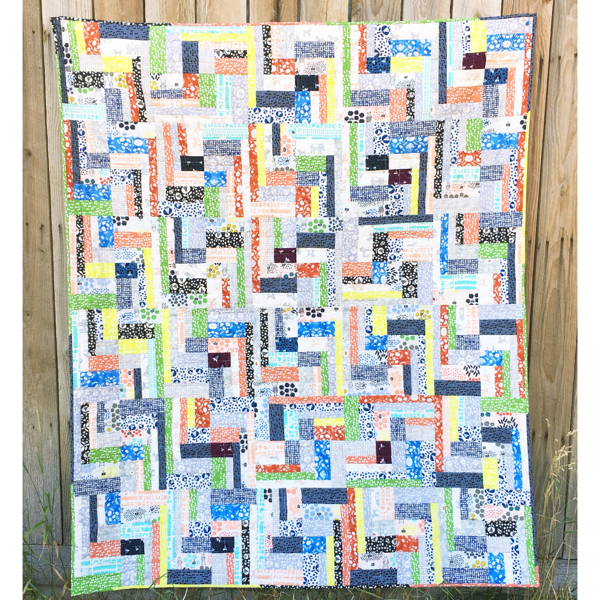 I love the colors you used…definitely the smallest piles in my stash since I seem to prefer to make quilts using cool colors. I just might need to try using warm colors!